Oh June, you were good to us. There was road tripping, hotel living, swimming, sightseeing, family visits, friends visits, toes in the ocean and more. There’s also been a couple of weeks of summer camp, and some glorious “at home” days where no one goes anywhere. The Fox turned TEN, which is surreal. He’s made his first major spending decision and purchased an XBox with his own money, He’s completed his first stint at Webelos overnight (!!!) camp, and well, I expect him to start shaving soon. Between the both kids, they’ve taken approximately 87 swim tests to swim at assorted pools and I’ve cut off just as many wristbands. As much as they roll their eyes to take yet ANOTHER swim test, I’m so glad that pools do this. No one wants to think about accidents and water rescues, but they happen every year. Last year in Indiana alone, there were 114 drownings, 29 of which where children. Goldfish Swim School (our go-to place for swim lessons that include water safety) has joined the Indiana Drowning Prevention Coalition . This coalition exists simply to prevent the unthinkable from happening, and teaching water safety is a huge component of that. Yes, kids, you’re going to take another swim test before the lifeguards let you in the deep end. Again. Yes, kids, you’re going to take a swim break as dictated by pool policy to give yourselves a break and for the staff to clear the pool. No, kids, you can’t swim in the hotel pool unless Dad or I are in the room watching you. Yes, you’ll have to get out if we, even if only to go to the front desk for something. No, kids, we’re not getting in the water if there’s a double red flag. Or if it’s thundering. Or if there’s anything that makes it unsafe. Summer is more fun anyway when everyone’s being safe. Here’s to July being just as much fun and waterlogged as June! It’s swim meet night @goldfishswimschool! The Fox did a great job on his freestyle heat! I cannot believe we are down into the single digits when talking about weeks of school. 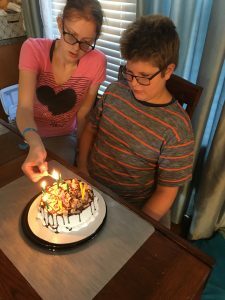 It’s weird to have kids old enough where midterm grades matter, but we do, and the grades do, and they’ve already been sent home. Standardized testing is wrapping up, and someone who shall remain nameless HAS PICKED HER CLASSES FOR EIGTH GRADE. Since she just graduated kindergarten last month I’m not sure how it’s possible, but when she looks down at me and shakes her head, I know it’s true. Since winter break, I’ve been penciling in our summer. There’s a coding camp for the girl, a Webelo Adventure Camp for the boy, and Art camp for both of them. They might even check out some of the programming at the local game store. The boy’s also going to the local traditional day camp he loved last year. This year, he had to pick between swimming and soccer as his focus for one week. 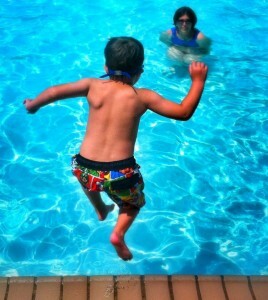 He looked at me like I was new and said, “Swimming, mom, it’s what I do. I want a week of basketball and a week of swimming.” From his mouth to the camp director’s ears. After all, swimming is what he does. I love how he stated that. He’s right – he’s been swimming weekly at Goldfish Swim School for nearly 18 months. Last Friday he took part in his first SwimForce swim meet, and when it was over he asked, “Can I do this again?” Swimming is absolutely what he does. Does your camper need to get summer ready? Sign up for a Jump Start Clinic and get a month’s worth of swim lessons done in one week!